Though all things seem to have settled down and it has been considered a wrinkle in time, Nora Aunor the greatest actress on the face of Philippine cinema must nevertheless be thankful that she was not bestowed the recognition of National Artist. She should be thankful for not being conferred by a President who doesn’t seem to know anything about sining (art). I have yet to read or learn in the news that the present Philippine president supports Philippine art. She should be thankful for being nominated by her fellow potent Philippine artists but only to be scratched by a non-worthy President because this made a lot of people especially today’s generation to be interested and curious about how magnificent her body of work has been. She should be thankful because her not being declared a National Artist pushed me to watch one of her greatest works entitled Bona. 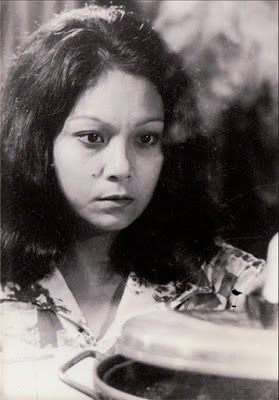 Bona, directed by the equally genius Lino Brocka, remains significant and substantial in today’s time. The story and characters still remains to exist in today’s Filipino realm. It is unlike other films made in the past that when viewed now would already look silly and stupid. It remains germaine and relevant up to this day. Some would say that Bona (the movie) would have been a better film if it explained why Bona (the character) had so much obsession and bizarre infatuation towards Gardo (a bit player and struggling movie actor). For me, this impenetrable and baffling element made Bona a great work of art. It is like conveying that feelings of passion, adoration and reverence need not be explained for it is simply unexplainable. Bona, the movie is so relevant! Simply look on how we, the masa (ordinary middling populace) adore and revere today’s movie stars. Can you imagine today’s glamorous movie stars being so filthy rich when in fact they did not even finished high school or college? Furthermore, like Bona, we are so unexplainably awestruck by the charm of these movie actors and actresses, majority of us even had the bizarre obsession of voting for them during election to occupy crucial seats in government offices. Only to be duped and hoodwinked later on by these very celebrities (slash now-government-executives), similar to that of Gardo towards Bona in the movie. Surprisingly, even though the movie is already 15 years old, it still depicts the poverty and destitution that an ordinary masa endures to experience and suffer from. It felt like this unglamorous movie was just done yesterday! It is so unfortunate that the country’s presidents in the past and the present (the one who refused to name Nora a National Artist) seem not have done enough to alleviate these adversities. Now that the President has gone over with the condemnation by the Philippine art community because of his dim-witted decision of not declaring Nora a National Artist, he should find time to watch Bona the movie. He would definitely get enlightened and learn a lot about Nora, Bona and the masa. ← The Heirs: What Crown Are You Trying To Wear?